A $10,000 free roll has been added! Draftkings has added even more value for their players to their Week Two Fantasy Football Schedule. This Free roll is in addition to the Week 2 $100,000 Customer Appreciation Free roll already on the schedule. The $10,000 FreeRoll Week Two starts at 1PM ET on Sunday, September 20th, includes all Sunday and Monday NFL Games, is a single entry contest and pays over 2000 of the top finishers. Contest tickets are good for play on any sport. 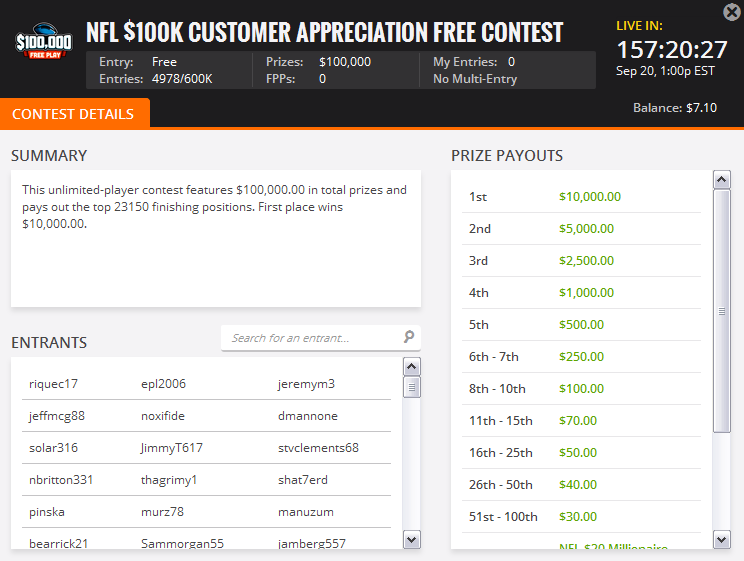 After you set your $10K Line-up, go to the NFL contest lobby. Scroll down to the $100K Customer Appreciation Freeroll. You can enter and create an entirely new line up or import the $10K line up you just set. The $100K Free Roll starts on Sunday at 1PM ET, includes all Sunday and Monday NFL games and pays out over 23,000 winners with $10K to the winner. You’ll then be ready for an exciting week end of NFL action and can cheer your teams to victory……..
DraftKings currently has over 7500 football contests open for this Sundays NFL Action and is constantly adding more contests as these fill up. That totals 3 free entries to over $1.1M in fantasy prize money, that you could be winning your share of……..
DraftKings is putting up a $100,000 Free Roll this Sunday……..
That’s right a Free $100,000 Fantasy Football Contest. No restrictions, No Password, No deposit needed, everyone is invited………..
No other DFS would even think of making such an offer. Just sign up here and you can draft your team today, what are you waiting for?????????? DraftKings is holding this Player Appreciation free roll to celebrate their players success and the fantastic response to the 2014 weekly fantasy football season on DraftKings. I would guess there will be at least 100,000 players entered, figure on 170 points as enough to win some cash. There will be 15K winners paid so on average about 1 player in 6 will win something. Line-ups must be in at 12:55PM ET to play. Completely Free Entry, a total of 15350 places will be paid out. 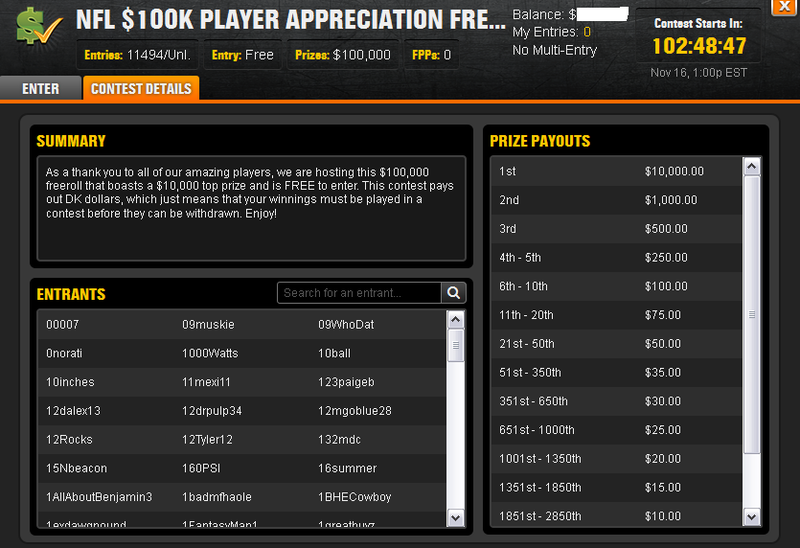 $10K to the winner, $1K to 2nd place, $500 to 3rd, top 10 win at least $100. Almost 3000 finishers will win at least $10 and 1350 players win will $20. 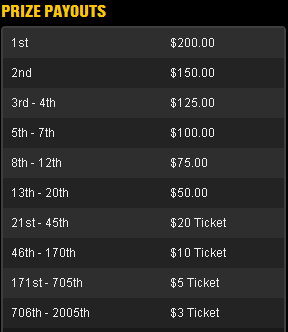 If you’ve been looking for a reason to try DraftKings, I think this could be a really good reason, don’t you? DraftKings has a complete lineup of weekly NFL Fantasy Contests every week.